Hosted by Damien Martin and Hannah Thornton and held at Southern Cross martial arts. We arrived three days early for the Gold Coast seminar as we wanted to get in a bit of sightseeing; it's a beautiful area with lots to see and do. We visited the Hinterland, the Australia zoo (made famous by Steve Irwin) where Michelle wowed the Crocoseum with her monkey impression, and took a tree walk 16m above the forest floor. Sensei arrived on Friday along with the Melbourne contingent. As Damien has already written a summary of the training at Gold Coast I won't go in to details other than to say it was well organized by the hosts Damien and Hannah who impressed me with their professionalism, and dedication to the kenkyukai and tairabunkai training methods - Damien and Hannah in addition to looking after us and putting us up are both extremely knowledgeable and serious martial artists and run a fantastic full time program at Southern Cross Martial Arts. They also have two fantastic and sweet American bulldogs, Ned and Kelly, who I hope we didn't spoil too badly! Monday was a free day and we accepted an invitation to lunch from Patrick McCarthy. Lunch was a whirlwind affair with McCarthy Sensei enthusiastically conversing in English, Japanese and Chinese (to the wait staff), and invariably getting the three mixed up from time to time. He told some of the funniest jokes in Japanese I have heard and was never short of an amusing anecdote or three. The frantic pace continued after lunch with a tour of his honbu dojo and we were given a glimpse into his vast knowledge of both martial technique and history. McCarthy Sensei was really keen to meet Sensei as he has said publicly that Sensei is the only teacher currently in Okinawa thinking outside the box (and other things, but I won't go into that here). On Tuesday it was off to Melbourne with the tairabunkai entourage. Tuesday was the grocery store (Sensei likes to go to the store and pick out a few things for the week, especially vegetables - lettuce and celery, some snacks, and meat - in this case lamb, and of course the odd bottle of wine) and settling in at Pete Keogh's home who was kindly putting us up, with Rex's (enthusiastic) permission! Wednesday was a bit of training on the patio. These impromptu training sessions are the icing on the cake at tairabunkai seminars and why I would always recommend arriving a day early or leaving a day late for seminars. Sensei worked with me on the "eight" (he counted them) different hip movements from Goju kata and it always amazes me, no matter how many times I see it, the mastery of martial movement and body control he displays. Thursday we were treated to a trip to Melbourne Southbank by Jo Bell and Steve Nedelkos. We had a pleasant walk around and then lunch. Steve had a class that evening and it was agreed that Sensei would make an unscheduled visit prompting Steve to spend the next hour on the phone so that none of his students miss the session. After a bit of a drive we stopped off at Steve's beautiful home, said hello to his charming wife Janine and sampled some wonderful coffee (coffee in Australia by the way is the best coffee I have had anywhere), on the way to the dojo. At the dojo a Muay Thai class was just finishing and this gave us an opportunity to meet some of Steve's students who were waiting in the wings. 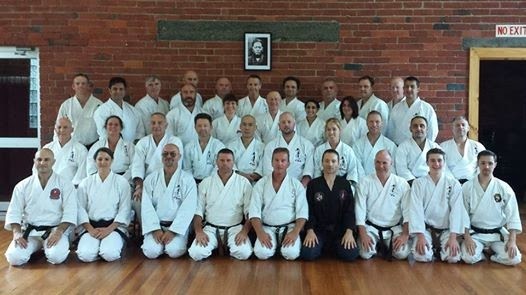 It is striking that here in Australia there is a large contingent of high ranked and experienced martial artists who are going back to their roots and rediscovering Goju ryu under Taira Sensei. This movement began with Bryson Keenan and continues under guidance of Steve Nedelkos, Pete Keogh and Damien Martin. The martial artists here are some of the most open minded, enthusiastic and ego free people I have met. The class tonight focused on the fundamental drills, particularly open close which was a theme of the Australia tour. Also impressive was how well the majority of seminar participants were versed in the fundamental drills. This meant that Sensei could move ahead at a faster pace referencing the bunkai though the drills and tweaking the execution of the drills through correct arm positioning, forearm rotation and so fourth. Thursday Pete took us to his St. Kevin's college high school class. Pete has been teaching here for many years and it was impressive to see 50 or so enthusiastic high school kids ranging from beginner to brown belt being put through their paces. It's a testament to Pete that these young men (it's a boys high school) are learning real karate and not some watered down version for the school system. The boys were thrilled to have Sensei take them through a class of kata, ippon kumite and open close type drills. At the end of the class the karate captain presented Sensei with a gift and delivered a well practiced short speech in Japanese. After a short break and another trip to the grocery store we drove to the McKinnon hall to watch a kids class before the later adult class. Louie the instructor invited Michelle to take a portion of the class and it's not an exaggeration to say that students, dojo teachers and the parents watching were blown away with Michelle's teaching skills and charismatic manner; so much so that they are talking about bringing her back to Australia to impart her teaching methods. An hour long adult class followed the children's class, taught by Sensei and served as a good warm-up for the upcoming weekend seminars. The Melbourne seminars consisted of 2 hours Friday evening followed by a grading, and 3 hours Saturday and Sunday 1-4pm. Again it was quite noticeable how almost all the participants had an understanding of the fundamental drills (very different from seminars I had been to only a few years ago). Because of this Sensei was able to move on quite quickly with the open close theme and introduce variations to the drill. All of the bunkai from various kata was presented in relation to open close, in fact Sensei quite clearly stated for the group that ALL bunkai is open close. As with all Sensei's seminars the challenge was to keep the mind focused and keep up with his constant, although on theme, add ons. For me personally being used as his uke to demonstrate for most of the time it is amazing to feel the subtle changes he inserts into the technique and the immense difference that these changes make to the outcome. Fortunately we took a lot of video recording some of the additions to open close and other drills (so look out for another DVD coming soon). Another theme (during discussion outside of seminar time) was the use of the spine along with breathing and the hara, using strength from the connective tissue and not muscle, to develop devastating technique. Sensei tied this in nicely during the seminar with occasionally using his "relaxed hit" (usually when I was in mid sentence) to make his point. All in all the seminar was an overwhelming success, well attended and well organized by Pete Keogh and his amazing team of dedicated teachers and students. The grading on Friday was one of the best I've seen with the three candidates having been well prepared along the lines of the new kenkyukai grading rules as adopted in Okinawa 2013. It was a clear reflection of the seriousness of Steve Nedelkos and Pete Keogh. On Monday morning it was time for Michelle and I to head off to Tasmania for a couple of days of sightseeing. We were met at the airport by my old friend Mike Clarke who I hadn't seen for over 20 years. He took us for a short hike in Launceston; a great way to get the cobwebs out from all the traveling and a chance to catch up after so long. After a couple of hours we bid Mike farewell and headed off towards the east coast of Tassie (as the locals call it) where amongst other things we enjoyed a wonderful hike to wine glass bay and beyond. Everywhere we travel with the kenkyukai we are well looked after and this time was no exception first in Gold Coast and then in Melbourne. We cannot thank enough everyone who gave us such a warm welcome and made us truly feel like family. We made so many new friends and reinforced friendships already made - too many to mention here. Of course lastly a big thank you to Sensei who puts so much thought and time into continuing to develop his technique both for his own training and his teaching. I know I'm preaching to the converted here but it is good to remind ourselves of how lucky we are to have Sensei as our guide and to be part of a group where training is the priority. I hope this account has been of interest and finally I would urge everyone to make it a priority to attend kenkyukai seminars whenever you can.